Central Coast National Marine Sanctuary (10 point) Economic Study. A new Central Coast National Marine Sanctuary would bring substantial positive financial, environmental, and social impacts to San Luis Obispo County, adding up to a “Triple Bottom Line” win. 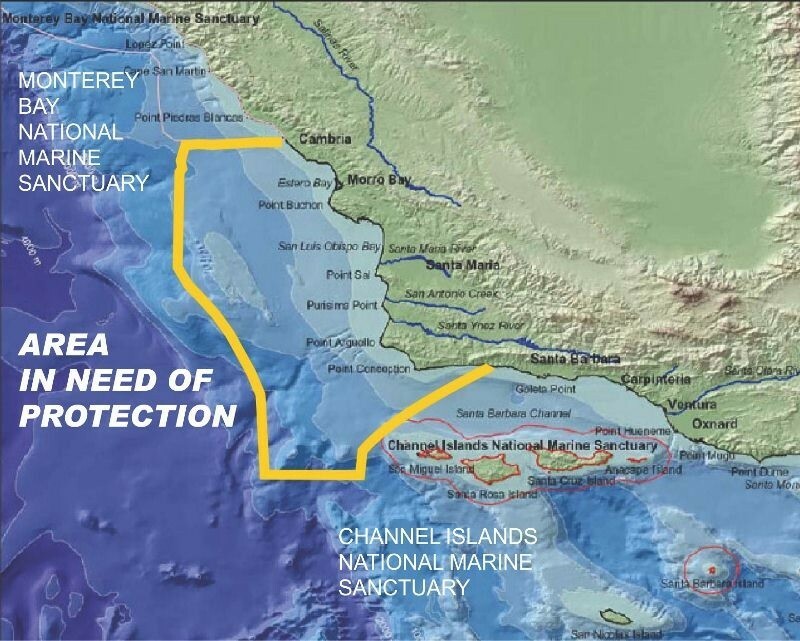 The proposed Central Coast National Marine Sanctuary would add at least 23 million dollars per year to the local economy and create at least 600 new jobs. We are pursuing sanctuary designation to preserve unique cultural and natural resources and to permanently prevent offshore oil and gas development. California’s coastal communities depend heavily upon tourism and both recreational and commercial fishing to support their local economies. Protecting cultural and natural resources makes good economic and environmental sense. A new Central Coast Sanctuary would bring with it new government offices, staff and infrastructure. Economic projections show these investments alone would likely mean an annual economic impact of $3,265,500 and the creation of 44 new jobs for San Luis Obispo County. One of the major components of sanctuary designation is increasing ocean research and additional research funding. If the Central Coast sanctuary were to only bring in 10% of the funding that the Monterey Sanctuary has for research, we would expect to see at least $2-3 million in new money spent for research in San Luis Obispo County annually. The proposed Central Coast National Marine Sanctuary includes research institutions such as California Polytechnic State University, and Morro Bay National Marine Estuary, which could become anchors for research and attract significant outside funding. If the San Luis Obispo coastline is named a National Marine Sanctuary, the region will be able to leverage a “brand identity” likely to significantly increase recreational and environmental tourism to the region. The proposed Central Coast Sanctuary is projected to increase tourism in San Luis Obispo County by at least 5%, providing an annual economic impact of $11.8 million in new tourism revenue and 334 new jobs. Using standard employment multipliers, the region could see a total economic impact of more than $18 million and 547 new jobs from increased tourism alone. National Marine Sanctuaries have a track record of bringing economic benefits to California’s coastal communities. The Monterey Bay National Marine Sanctuary Visitor Center and Education Facility, which opened in Santa Cruz in 2012, contributes $10.9 million annually to the local economy. The Channel Islands National Marine Sanctuary began building new offices and research facilities on the UC-Santa Barbara campus—infusing $8.2 million into that community—and the Sanctuary continues to receive funding to complete a public education and outreach center, which is currently under construction. This entry was posted in Chumash. Bookmark the permalink.